Don’t throw away a perfectly good dishwasher. So they bought a new dishwasher for about $600, and then they pay us to get rid of the old one. It’s likely that they didn’t need a new dishwasher. Dishwashers typically last 9 to 10 years. If the relatively young dishwasher isn’t doing its job, most likely you have gunk clogging a part of the machine called the food chopper. 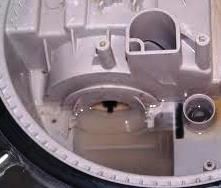 If that part is clogged, you lose water pressure, which is the main force that cleans the dishes. You can clean out this gunk in a about the time it takes to drive to the store to buy a new dishwasher. You need a couple of tools like a star-bit screw driver and some needle-nose pliers. If your machine really is too old to repair or clean, call Junk King and we’ll recycle it for you. This entry was posted in Debris Removal, Fairfax Junk Removal, Recycle and tagged appliances, dishwasher on July 23, 2014 by Alex Powers. Last updated August 1, 2017 .